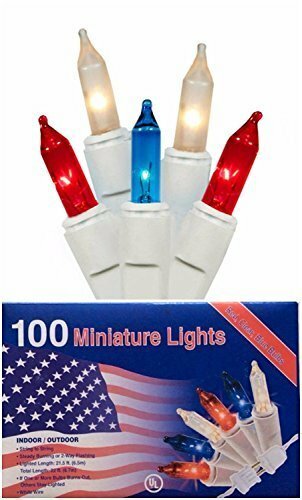 These red white and blue patriotic lights will brighten your summer nights in colorful celebration of the good ole' USA. Durable, versatile and beautiful, mini lights, patio lights and icicle lights give you tons of options for displaying them. 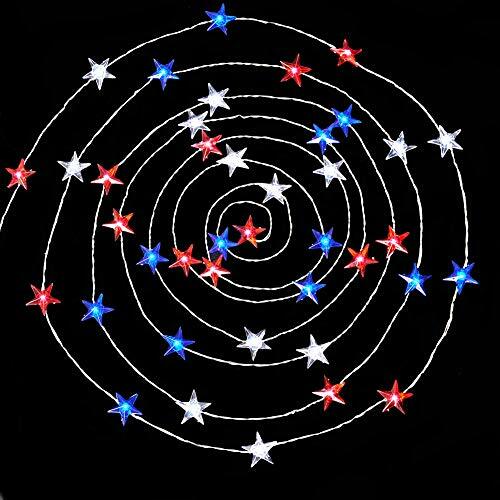 String white wire icicle lights along the roofline for a star spangled effect. Decorate bushes and trees or outline structures in mini lights. 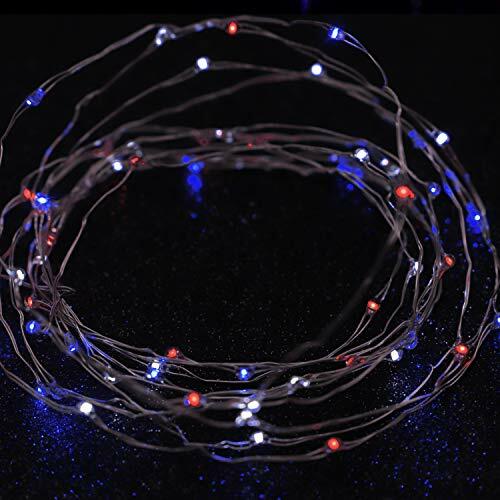 And nothing makes a deck or patio more patriotic than colorful red, white and blue patio lights on white wire. 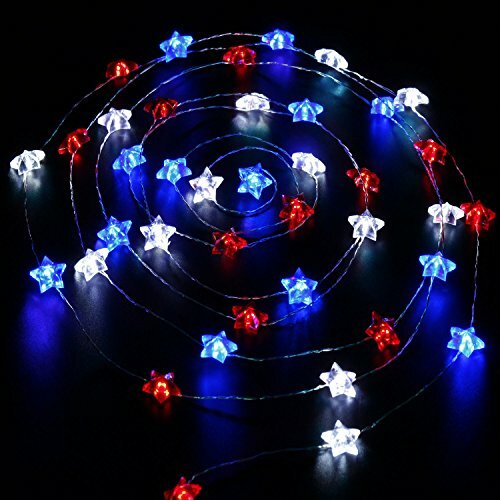 Celebrate July 4 in color and style like never before, with your choice of these patriotic lights. 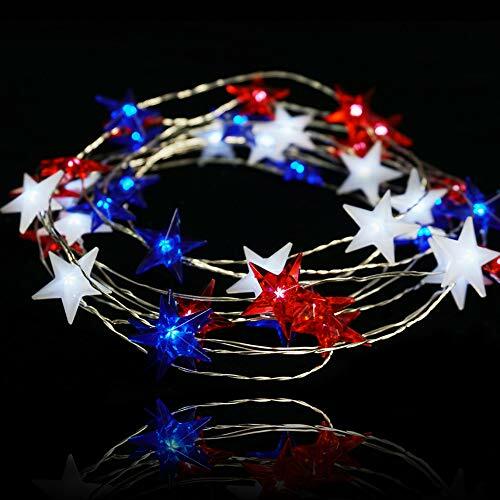 Show your patriotic side with Impress Life Americana star Decor String lights for July 4th Themed Independence Day Decoration! 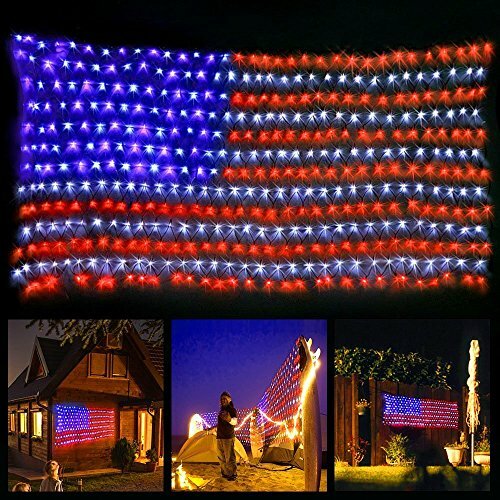 Perfect indoor & covered outdoor decoration for the 4th of July, Memorial Day, Veterans Day, or any time of year! 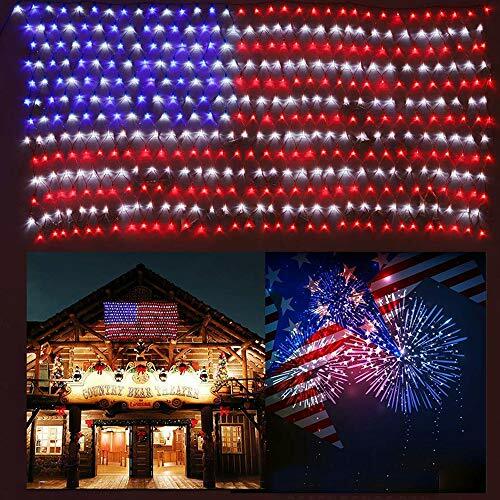 Perfect to both indoor and covered outdoor spaces, create a fun,pride and glory ambience for your independence day celebration, party or family get-together 1. The string light is waterproof and designed to withstand light rain or water spills. 2. Battery-operated, requires 3 AA batteries (not included), remote capable(remote included) 3. 2/4/6/8 Hrs timer used with remote control, build-in 6 Hrs timer provides automatic shut off. Build-in and remote capable timer function (if you turn it on under 6 Hrs timer mode at 3 PM, it will turn off at 9 PM and turn it on again 3 PM the next day) 4. 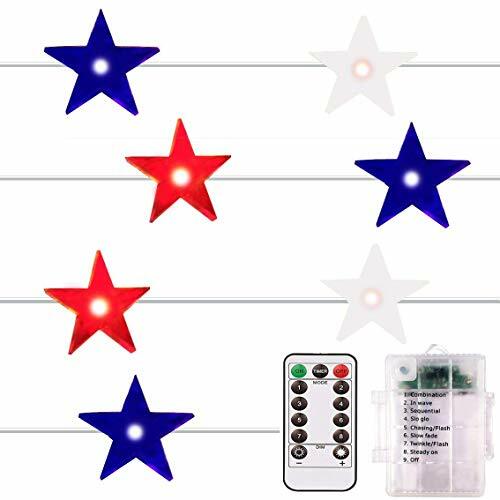 You can chose flicker mode and control the intensity of light, rang of remote control is around 5 meters Package include 1x 10ft 40 LED Independence Day Decor Light 1x LED Remote Control Warm tips: 1. DO NOT soak the battery box in water. 2. Customers may receive product in package with words "for indoor use only". All of our string lights products have been updated for outdoor use. There is no exception. 120V AC, UL approved for indoor/outdoor use and comes with spare fuse. 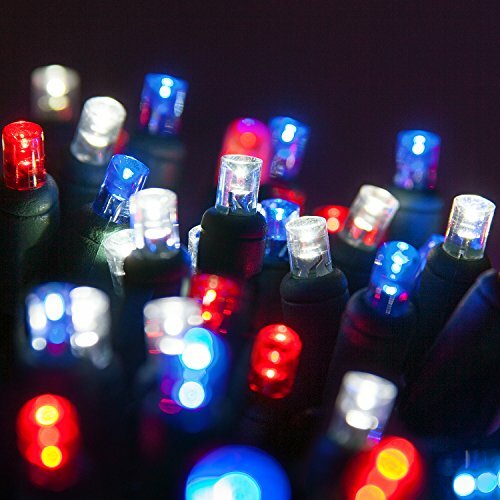 Materials include fireproof PVC, pure copper wire, and high-quality LED chips that are cool to the touch when lit. PVC is resistant to UV light and cold temperatures, flexible and easy to install. Applications include RV Patio, landscape, pathways and gardens. 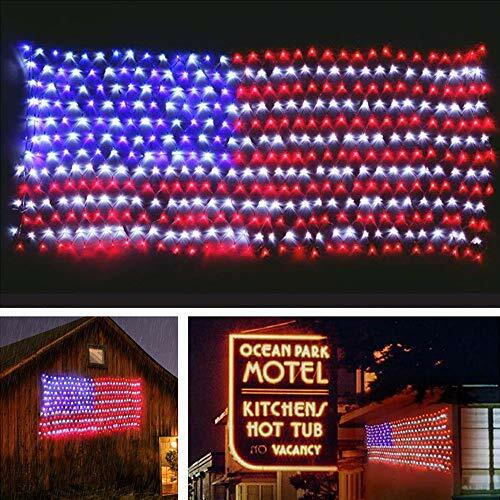 Product Information:Awesome American Flags lights for 4th of July, Parades, Holidays & GiveawaysSuper Bright 420 LED American Flag LightsThe LED American Flag is an original way to show your patriotism. 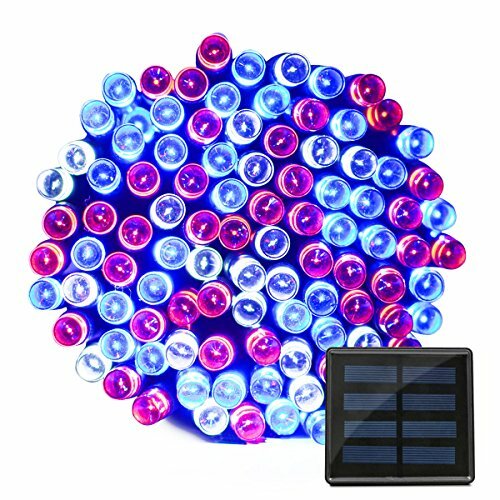 Perfect for year 'round display.Specification: Size：6.5ft*3.2ft/ 2m*1mLED Number:420Color:blue, white and redMaterial: Copper Wire and PVCInput voltage:Ac110V ,Output Voltage:24VLifespan:100000hoursLight Source: Plug InCUSTOMER SATISFACTION MONEY-BACK GUARANTEE:If you are not satisfied with the American flag lights, just return them within 30 days for a full refund. No questions asked, no hassle. 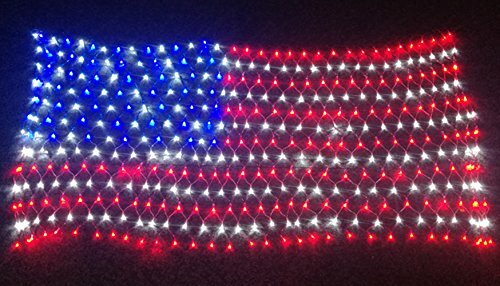 Click the Add to Cart button to have your American flag light shipped today. 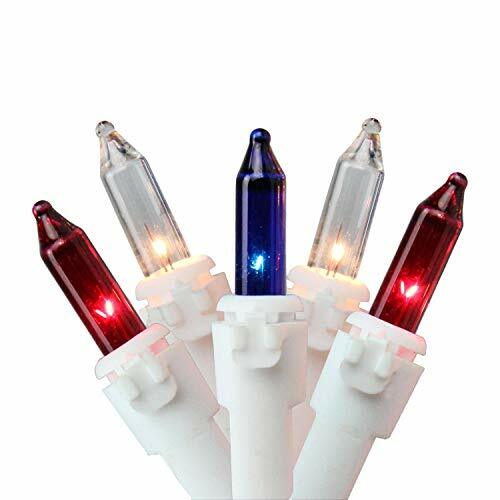 Size :2m *1m/6.5ft*3.28ft,420LED Input voltage:AC110 High brightness, energy saving,Lifespan 100000hours,waterproof connection. Material:100% copper,Waterproof property better and safer. 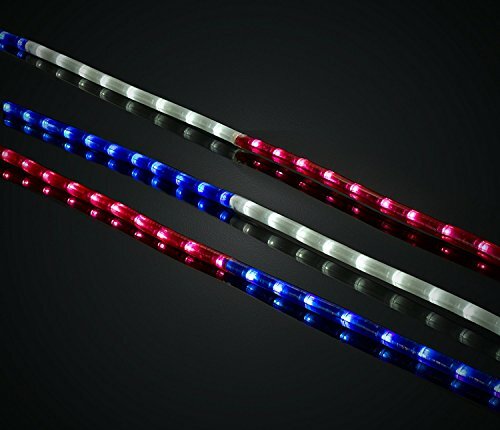 This is a unique product which can makes you more patriotic and awesome .